An overarching goal of Virginia’s farm-to-table effort is to cultivate deeper, more meaningful relationships with farmers and the broader community so people better understand the challenges and realities of today’s farming, particularly on a community, local, and regional level. To achieve this goal, Virginia Cooperative Extension, and educational partners like USDA- Natural Resources Conservation Service, Soil and Water Conservation Districts, and Virginia Sustainable Agriculture Research and Education (SARE), work to nourish collaboration and conservation to make farming profitable, durable, sustainable, and resilient. With farming and local agriculture on a good solid footing, rural and urban communities supported and dependent on farming will be more durable, sustainable, and resilient. An educational workshop on soil and water conservation in vegetable production (Courtesy of USDA). Agricultural soil, water, and associated wildlife and ecosystem resources must be sustainably managed for future generations. Sustainable stewardship of agricultural lands depends upon scientifically sound research and effective communication. 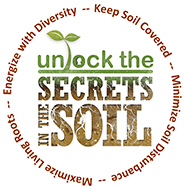 Healthy soils are productive and resilient soils. Wetlands and floodplains are essential to long-term resource sustainability. Farm bills should incentivize farmers and utilities to protect drinking water. Conservation of agricultural lands should not conflict with wildlife conservation. An informed public is necessary for sustainable management of soil, water, and associated wildlife and ecosystem resources. Responsible conservation management demands accountability. 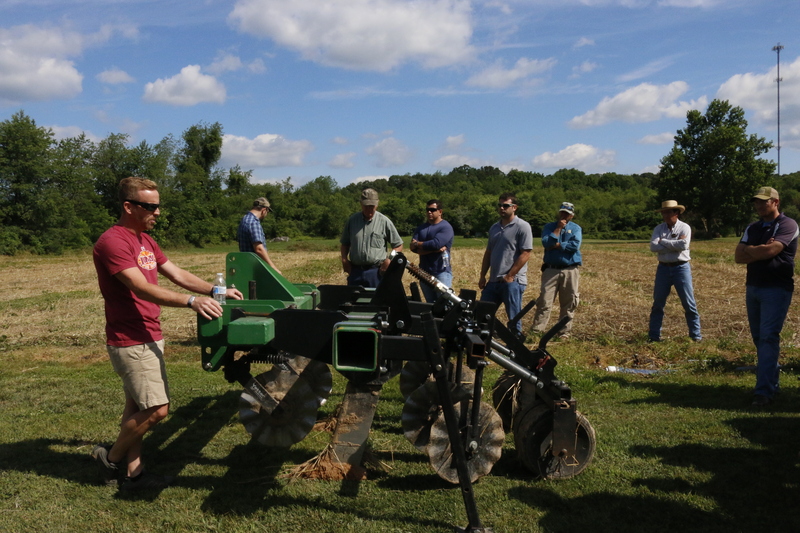 In sharing these eight principles and policies, the hope is to nourish deeper conversations around ecologically sound soil and water conservation and cultivate ongoing collaboration to benefit Virginia agriculture and communities. For the full article and additional information, please visit the Journal of Soil and Water Conservation and link here. 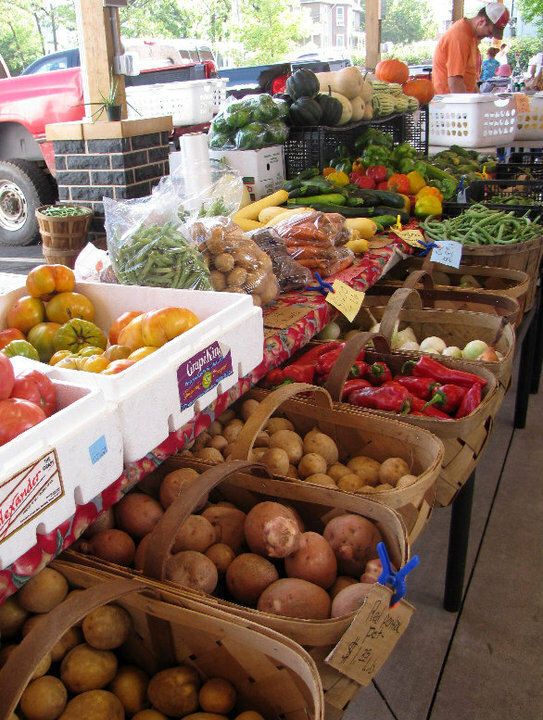 Why Continue to Promote Farmers Markets and Local Foods? Agriculture is Virginia’s largest industry with an annual economic impact of $52 billion, creating nearly 311,000 jobs for the state (VDACS). With such a strong agricultural industry, why is it important to continue to promote farmers markets and local foods in Virginia? Today, many people are two or three generations removed from farming and actual day-to-day food production. Farmers markets are often the first farming and agricultural enterprise people who did not grow up on a farm relate to in a real and personal way, particularly as they get to know and interact with market growers and vendors on weekly visits. Of course, more can be done to educate people about agriculture and the challenges of farming as a livelihood, but these market relationships are a good starting point for additional conversations. Farmers markets showcase the sights, smells and sounds of the community, while giving a glimpse into agriculture and local food and farm production. Markets also encourage social and community interaction. A study by the Project for Public Spaces reports that customers have on average 10 more conversations at a farmers market than at a supermarket. Okay, so why promote locally grown Virginia foods? With the competitive nature of agriculture, it is important to optimize and utilize all markets available to Virginia producers from local and regional scale to national and international scale. Do you know that Virginia households spend over $20 billion buying food each year, including about $12 billion to eat at home! Additionally, tourists to Virginia spend another $5 to 6 billion purchasing food. However, even with Virginia’s strong and diverse agricultural economy, Virginia producers are only able to capture a small portion of these food dollars. Also, it is hard to know what ingredients are actually grown and procured in Virginia. Therefore, promoting local foods is about trying to capture some of the food dollars that are already out there — even if it is a small bump in the current percentage and amount. The definition of local food can be a bit confusing in how to define a specific geographic boundary, but local food is more about relationships and connections to farming; the story and community; freshness and taste; local economies; seizing the opportunity; enhancing resilience and diversity. In Virginia, there are many people who have good ideas to promote farmers markets and local food system development, but a continuing issue is finding funding to get things moving in the right direction. Also, writing a grant can seem daunting. 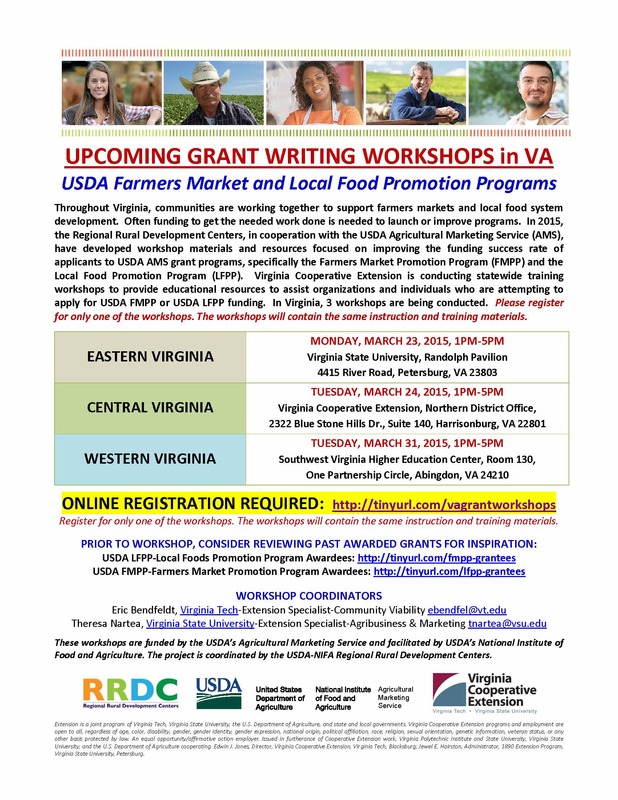 Virginia Cooperative Extension, in partnership with USDA-Agricultural Marketing Service (AMS), Regional Rural Development Centers and Penn State University, is offering three upcoming grant writing workshops in eastern, central, and western Virginia. 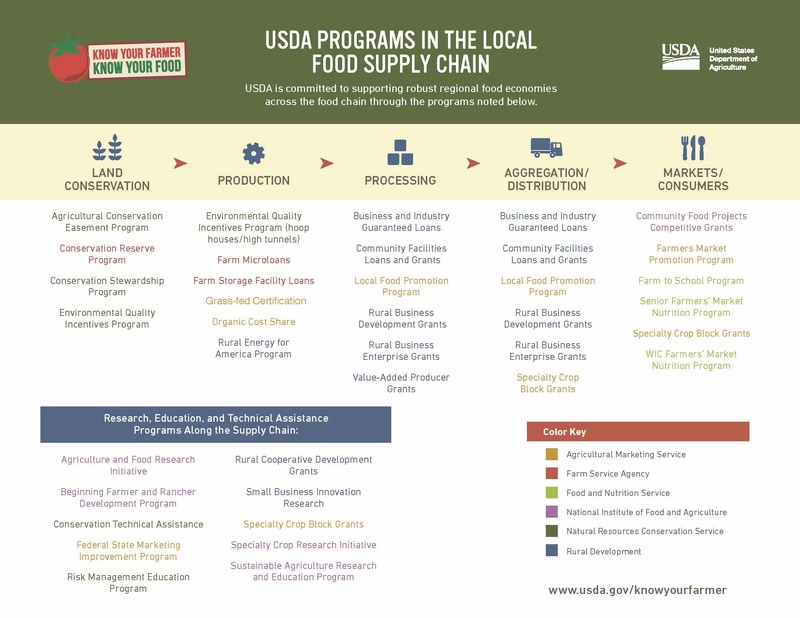 The workshop materials and resources have been developed and focused to improve the funding success rate of applicants from Virginia and other states to USDA-AMS grant programs, specifically the Farmers Market Promotion Program (FMPP) and the Local Food Promotion Program (LFPP). The workshops are FREE of charge and all are welcome to register and attend these workshops. Please share the attached flier and announcement with producers, farmers market managers, organizations that would be interested in learning more about and submitting grant applications to USDA’s Agricultural Marketing Services’ (AMS) Farmers Market and Local Foods Promotion Programs. Again, the workshops are FREE and all are welcome to attend. Discussion about whether to exclude livestock from local waterways and streams can be contentious at times. However, the practice is a high-priority for Virginia as the state tries to do its part to improve local and regional waterways. For many farmers, excluding their cattle from streams is the right thing to do and fits into their operation and management system. For other farmers, they have questions about the costs of installation and ongoing maintenance and how — or if — the practice can work on leased land. And for some farmers, being encouraged to exclude their cattle from streams feels like an intrusion of privacy and an infringement of their rights. Reduced visits and bills from the veterinarian. For farmers who have had questions about the costs of installation and ongoing maintenance and how –or if — the practice can work on leased land, they should know it is a high-priority and the state is providing resources to overcome any barrier to adoption and implementation of the practice. 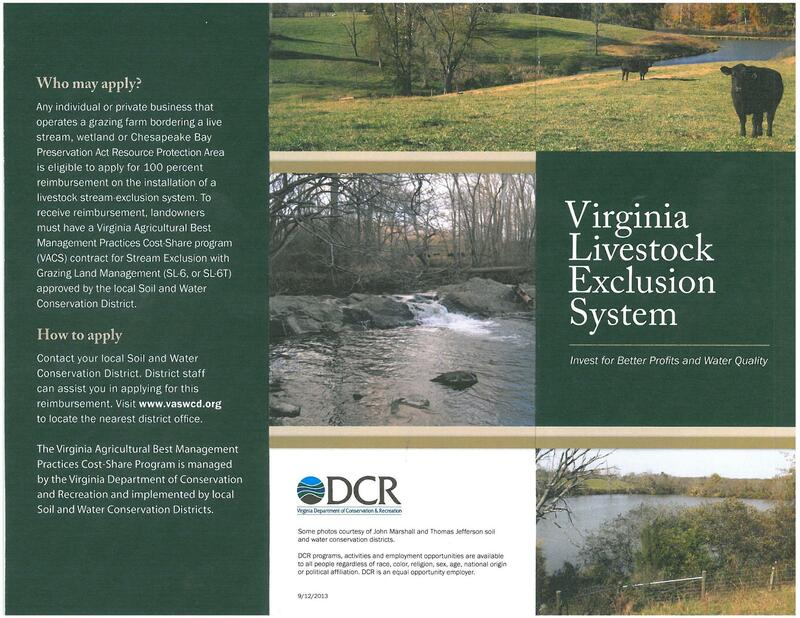 Virginia will provide 100% reimbursement on the installation of a livestock stream-exclusion system. 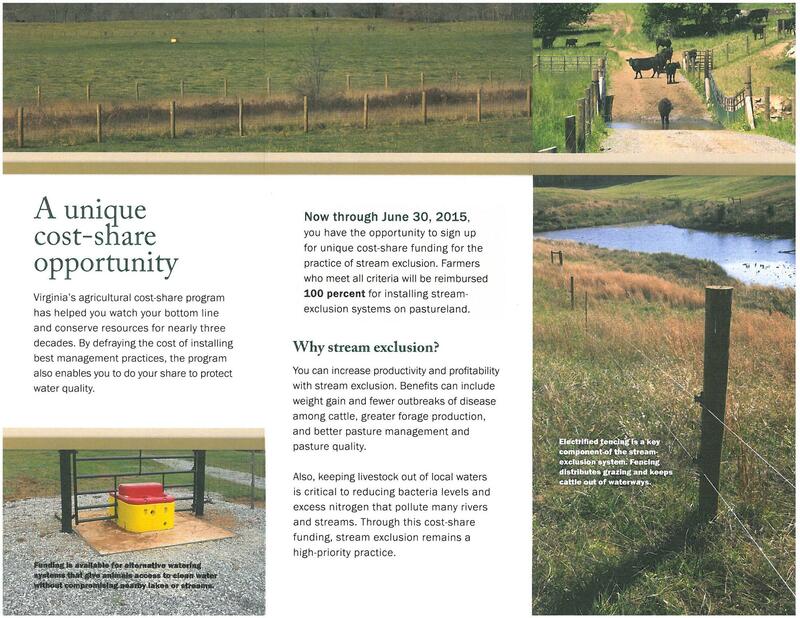 Farmers and landowners can sign up for the unique cost-share opportunity now through June 30, 2015. Do your part and do the right thing! Contact your local Soil and Water Conservation District to learn more about the practice and apply for reimbursement.